Most of the week was spent working on the holy water shape and animations. Although it’s straightforward to create a semi-transparent shape with an animation sequence on the surface to represent water, there were several places we got tripped up by the system. The biggest one had to do with transparent object sorting, which meant that the water object was not being rendered on top of other objects but rather behind. So the font itself was obstructing the view of the water inside of it. We fiddled around with different options, but in the end we got it all sorted out (so to speak). Most of the rest of the work dealt with finding good, cheap animations to license to represent the different versions of the holy water as the game progresses — some calm, some like boiling water, some like a whirling toilet bowl. Some successes and some failures in that regard. Other than that, I spent some time correcting a few bugs, in particular one that gave an error when trying to interact with Matteo in Act 2. Turns out I uncovered a problem with the way I implemented the “ghost” objects for NPCs once we advanced to Act 2. 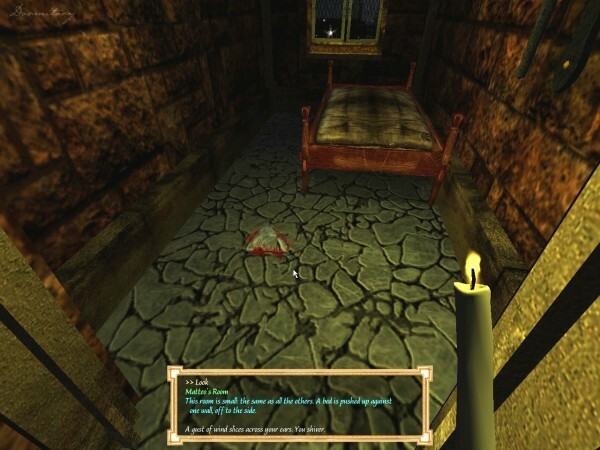 Ghost objects are basic, lightweight objects that represent the different characters in the game, so that there is an object that responds to commands or queries when the actual NPC is not at the player’s current location. So if the player types EXAMINE MATTEO, rather than getting the bland “You see no such thing” library message, the player will see something more relevant such as, “He isn’t here.” This one took a bit of time to fix, but it now seems to be working well. This week’s screenshot shows Matteo’s room in Act 2, empty now that he and Lucca are gone. The mysterious flagstone lies at the center, bloody from Lucca’s fingers—and no longer a problem for the REMOVE command. Matteo’s room in Act 2. What could be under that flagstone?